MACHINIMA! TEORIE. PRATICHE. DIALOGHI, A COMPELLING COLLECTION OF ESSAYS PUBLISHED IN 2013 BY EDIZIONI UNICOPLI IN ITALY FEATURING CONTRIBUTIONS BY HENRY LOWOOD, MIZUKO ITO, HUGH HANCOCK, KARI KRAUS, EDDO STERN, MARQUE CORNBLATT, AND MANY MORE. The book was edited by MATTEO BITTANTI and HENRY LOWOOD. Matteo Bittanti is the director of GAME/PLAY. DESIGN, DIRECTION & PRODUCTION Master's at IULM University where he also teaches a course in Media Studies. Lowood is Curator for History of Science and Technology and for Film and Media collections at Stanford University. Lowood launched the HOW THEY GOT GAME initiative at Stanford in 2000. "Machinima! Teorie. Pratiche. Dialoghi illumina uno dei fenomeni di ibridazione mediale più interessanti degli ultimi vent'anni. Contrazione di machine e animation, il machinima si colloca all'intersezione tra videogioco e cinema, animazione elettronica e performance in tempo reale nei mondi virtuali. Opera derivata ma inaspettata, il machinima ha introdotto una nuova estetica, ma soprattutto, un nuovo modo di giocare con l'immagine. La sua storia è contraddistinta da innovazioni e imprevisti, alterazioni e alterchi, hacking e modding. Il volume si articola in tre sezioni. Le prima, Teorie, inquadra il fenomeno sul piano concettuale, storico e legislativo, illuminando testi e contesti produttivi, distributivi, giuridici e commerciali. La seconda, Pratiche, presenta i contributi di artisti e registi, producer e performer che hanno definito la natura del medium. Infine, Dialoghi propone conversazioni su temi che spaziano dall'arte al mercato, dal disimpegno ludico all'attivismo politico. 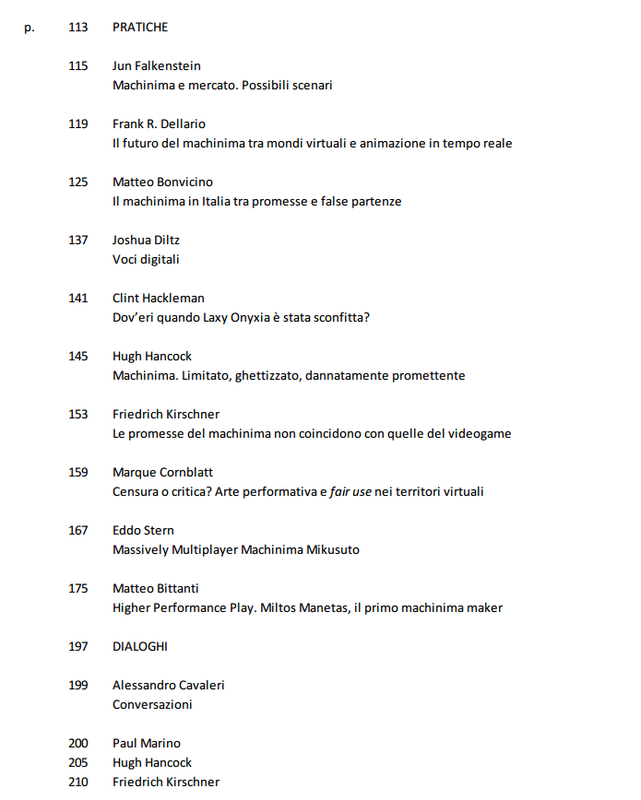 Il carattere interdisciplinare e l'eterogeneità degli approcci rendono "Machinima!" uno strumento ideale per comprendere le trasformazioni dei media e dell'arte contemporanea nell'era digitale." The book is part of the ongoing LUDOLOGICA book series edited by MATTEO BITTANTI and GIANNI CANOVA. MACHINIMA! TEORIE. PRATICHE. DIALOGHI is available on Amazon. 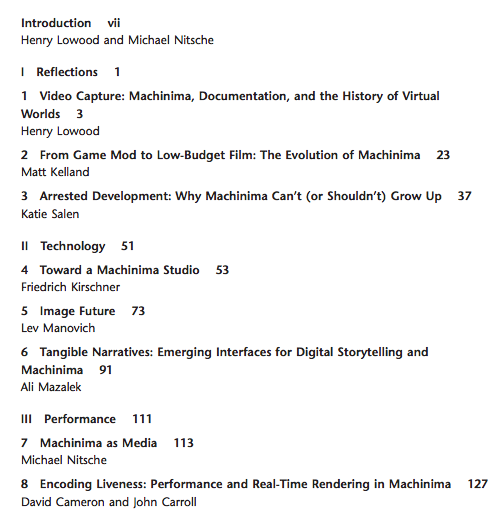 THE MACHINIMA READER, AN EDITED COLLECTION OF ESSAYS PUBLISHED IN 2011 BY MIT PRESS, FEATURING CONTRIBUTIONS BY LEV MANOVICH, KATIE SALEN, ERIC CHAMPION, DAN PINCHBECK, MATTEO BITTANTI AND MANY MORE. "Over the last decade, machinima--the use of computer game engines to create movies--has emerged as a vibrant area in digital culture. Machinima as a filmmaking tool grew from the bottom up, driven by enthusiasts who taught themselves to deploy technologies from computer games to create animated films quickly and cheaply. The Machinima Reader is the first critical overview of this rapidly developing field. The contributors include both academics and artist-practitioners. They explore machinima from multiple perspectives, ranging from technical aspects of machinima, from real-time production to machinima as a performative and cinematic medium, while paying close attention to the legal, cultural, and pedagogical contexts for machinima. 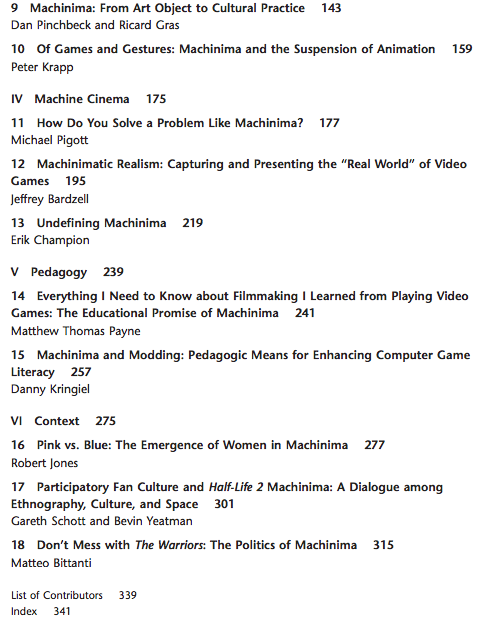 The Machinima Reader extends critical debates originating within the machinima community to a wider audience and provides a foundation for scholarly work from a variety of disciplines.This is the first book to chart the emergence of machinima as a game-based cultural production that spans technologies and media, forming new communities of practice on its way to a history, an aesthetic, and a market." This indispensable collection was edited by HENRY LOWOOD and MICHAEL NITSCHE. Lowood is Curator for History of Science and Technology and for Film and Media collections at Stanford University. Lowood launched the HOW THEY GOT GAME initiative at Stanford in 2000. Michael Nitsche is Assistant Professor at the School of Literature, Communication, and Culture at the Georgia Institute of Technology. THE MACHINIMA READER is available on Amazon.